Update: I added another observation so it's now five observations rather than four. Coming into Arsenal’s London derby with Queens Park Rangers, Arsenal had suffered a league loss to a then winless Norwich City followed by a defeat to Champions League foe Schalke 04 at the Emirates — the club’s first home loss in the group stage of that competition in 9 years. Arsenal’s 1-0 victory at the Emirates over a winless, 10-man QPR side that currently sits at the bottom of the Premier League table was hardly the emphatic victory that Arsène Wenger needed to quell the frustrations of Arsenal supporters. Arsenal’s lone goal came from a Mikel Arteta tap-in after the ball bounced around QPR’s goalmouth. Replays indicate that Arteta was unambiguously in an offside position; Mark Hughes and Queens Park Rangers are rightfully upset with the decision. (1) Arsenal continue to struggle to create scoring chances. The Gunners had 12 shots 5 of which were on target in the first 70 minutes of the game, but few of these attempts were genuine scoring chances. Other than a Ramsey header off the woodwork from a Bacary Sagna cross inside of 10 minutes and a Per Mertesacker header from an Arteta free kick at the beginning of the second half, Arsenal seldom created scoring opportunities until the final 20 minutes of the game. (2) Arsenal created several scoring chances in the final period of the game, but they did not take their chances. Wenger brought on Walcott for Wilshere in the 67th minute, Gervinho for Podolski in the 71st minute, and Arshavin for Gervinho in the 82nd minute after a Gervinho injury. The insertions of Walcott and Gervinho/Arshavin gave Arsenal more width and seemed to give impetus to the attack. In the 76th minute, the ball bounced out to a wide open Santi Cazorla a mere 15 yards from goal, but Cazorla — probably Arsenal’s most competent finisher with his feet — skyed his shot far over the goal. Soon after, Thomas Vermaelen fouled Stéphane Mbia who then kicked at Vermaelen from ground. Anthony Taylor’s decision to show a straight red card was uncontroversial. With their width and a man advantage, Arsenal managed 8 shots, 4 of which were on target, from the 80th minute onwards. Despite several good chances, Arsenal’s only goal came from an offside Mikel Arteta. Prior to Arteta’s involvement in the play, Olivier Giroud couldn't head a pinpoint perfect cross from Andrey Arshavin past Júlio César who made a number of fine saves in the final period. (3) Arsenal were fortunate to close out the final minutes of the game after Arteta's winner in the 84th minute. Even with a man advantage and only 6 minutes remaining in regulation time, Arsenal allowed QPR two promising scoring chances: Esteban Granero was in on goal in the 89th but pulled his shot wide, and Jamie Mackey had an even better opportunity in extra time that Vito Mannone did well to block. With such little time remaining, a man advantage, and a squad that prides itself on its ability to play a possession-based system, Wenger is likely furious that his side nearly dropped points from this fixture. (4) Jack Wilshere was impressive in his return to Arsenal’s lineup. Wilshere, who had not made a Premier League appearance since May of 2011 after a prolonged recovery from injury, rarely put a foot wrong in the 66 minutes he played. He impressively completed 44 of 47 total passes (94 percent) and 21 of 22 passes in the attacking third (95 percent), he successfully completed 4 out of 5 take-ons, he created one chance, and he had a shot on target. (5) It is unclear if Wilshere and Arteta have the complementary skill sets necessary to form an effective midfield partnership. Wilshere was an essential component of the Arsenal midfield in the 2010-11 season, and Arteta served a similar role in the midfield in the 2011-12 season. QPR’s visit to the Emirates marked the first instance in which the two have played in Arsenal’s midfield together. During the game, Wilshere and Arteta almost ran into each other on a couple of occasions. At times, Wilshere seemed to sit beside Arteta in a deeper midfield role rather than play a box-to-box role. Looking at the figure below that displays Wilshere’s passing, it is evident that he sprinkled passes from side to side. 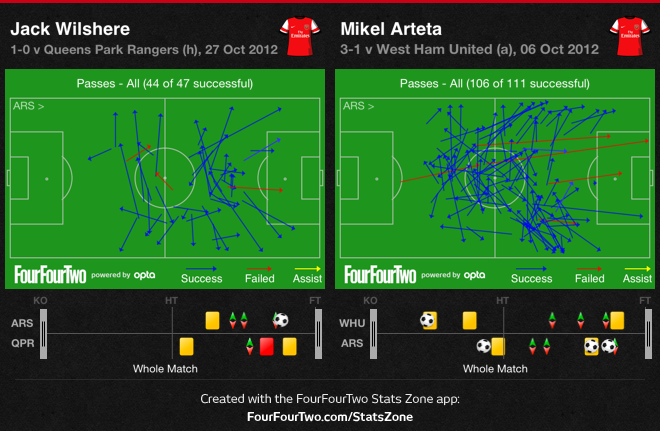 Arteta’s passing often serves a similar purpose (see, for example, his passing vs. West Ham). Arsenal have arguably looked most dangerous this season with Arteta and Abou Diaby in the lineup. Diaby’s style of play is generally more vertical, and his driving runs help link up the midfield with the attacking players. It would, of course, be rash to pass judgment on a midfield partnership that has existed for all of 67 minutes. I suspect as they play together more and as Wilshere improves his fitness levels, their partnership will improve. But, given the myriad of options in the midfield that Wenger has at his disposal, especially as players like Diaby and Tomáš Rosický return from injury, Wenger will need to seriously consider the most effective combination of midfielders rather than the best individual midfielders available for selection.